In 1998 Bentley sold 314 cars in the USA; that same year VW Group acquired the company, with a grand plan to double U.S. sales in two years. VW appointed a new President, and hired a team of executives to develop Bentley’s image and sales growth, prior to investing in a completely new product range. In fact VW Group Chairman Dr. Ferdinand Piech told me when I was first introduced to him in Wolfsburg in February 1999, that the USA would be the main driver to reinvigorate Bentley’s global sales resurgence. There would be no budget for marketing, advertising or promotion – the entire budget was to be dedicated to public relations. No pressure then. In 1999 our new American division began to build an image for the brand around three words – Power, Performance and Presence – and every activity was devoted to highlighting those qualities. Our first big media event, in 2000, was The Bentley Grand Tour, bringing together the current Bentley range and a group of 1920s Cricklewood Bentleys, kindly brought along by willing members of the Bentley Drivers Club of North America. The idea was that we would follow a route of around 220 miles, with journalists swapping from modern to vintage Bentleys through the course of a day, to inculcate them in not only the Bentley legends, but also the impressive performance of the Arnage sedan and the Continental R coupe. Our media group was top drawer, comprising the Chief Editors of all of the USA’s significant automotive publications, and our special guest for the Grand Tour was America’s first F1 world champion Phil Hill. Our base for the Grand Tour was Blackberry Farm in the foothills of the Great Smoky Mountains just south east of Knoxville, Tennessee. This 5-star resort is one of Tennessee’s major health and foody attractions, and its tranquil location provides not only beautiful mountain scenery, but access to some of the finest touring roads in the USA. Departing Blackberry Farm via the Foothills Parkway, we dealt with one of the area’s favourite sections, the ‘Tail of the Dragon’, a twisting, switchback hillclimb of more than 10 miles snaking up into the Great Smokies. From there we swept along the ridges above the Fontana Dam, before crossing into North Carolina, and a lunch stop at Lake Santeelha on the edge of the Nantahala National Forest. The Cherokee Indians named it Nantahala, meaning 'Place of the Midday Sun', because the forest canopy is so dense, the sun only penetrates to the forest floor at high noon. The media group were amazed that the trio of vintage Bentleys not only matched the pace of the current cars, but provided exhilarating driving experiences as well. Our return took us back down through the ‘Tail of the Dragon’ and back to Blackberry Farm, where Phil Hill regaled the group after dinner with tales of his long and impressive racing career. Which included a little-known personal connection to Bentley. He revealed that at one time he owned the original supercharged 1929 Bentley which Amherst Villiers used to develop and build the superchargers for Capt. Tim Birkin’s Bentley 'Blowers', which were entered in the 1930 24 Hours of Le Mans. This 'Bentley Grand Tour' became the foundation for building Bentley’s image in the USA, and was followed by a Grand Tour each year as the company reached out to a wider net of automotive and lifestyle writers. The decision to marry the role, image and performance of the vintage Bentleys, with the current production cars became a successful template on which to establish Bentley’s credentials in the buildup to the launch of Bentley’s most successful car ever – the Continental GT coupe in 2003. In 2001, two years after establishing the new company in the USA, Bentley Motors North America sold 592 cars. POSTSCRIPT: About an hour’s drive from Blackberry Farm is Dolly Parton’s extravagant resort, Dollywood. Obviously word travels fast in the Great Smokies, because whilst we were out driving, Blackberry Farm’s manager took a call from the lady herself. The owner of a pristine 1952 Mk.6 Bentley saloon, Dolly wanted to drive over the following day and check out the range of Bentleys we had assembled. Sadly we had broken down our program, and the trucks had already departed with all the cars on board. 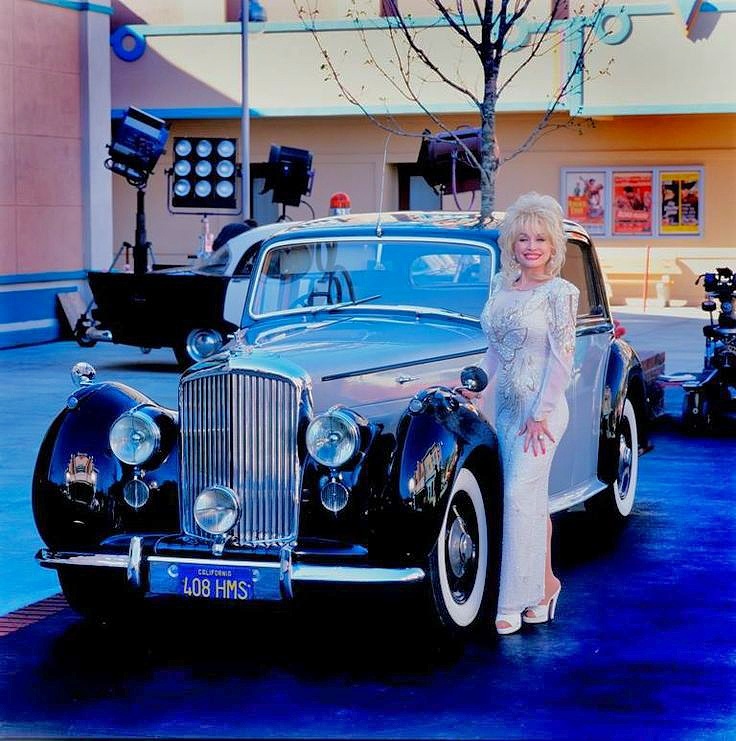 The manager said Dolly is every inch the lady, with perfect manners, and a keen interest in the history of the marque. I later discovered she had indeed placed an order with our dealer in Nashville, joining a list of very talented women who are Continental GT coupe owners.